Should something happen in the beekeeper's family, it must be told to the bees. The bees were considered part of the family, and would only thrive in families that upheld them with regard. Usually, the bees are told is when the beekeeper himself, dies but, if there are weddings, births, or deaths, the bees should know. 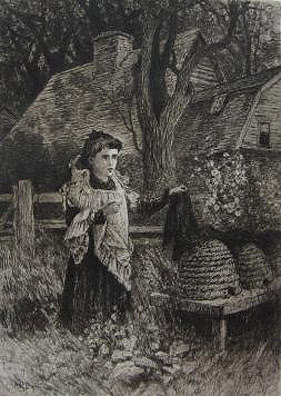 There are some that say you should knock once on the hive, and then whisper it from the side of the hive, into the entrance, but all manner of the telling was done: beehives were shrouded in black cloth when someone died, or a piece of funerary cake and wine was left at the entrance of each hive. In some cases, the hives were even repositioned to face the grave of the beloved deceased. I've nary an idea as to why there is this tradition of Telling The Bees, but there are records of this in old Ireland, England, Olde Europe, as far back as the Middle Ages. So then, I ask you, what happens when the great news to tell the bees is actually about the bees themselves? How does one tell them? What if the bad news involves not being able to deal with those little winged families, and that the "death" is within a business that you have grown to love? 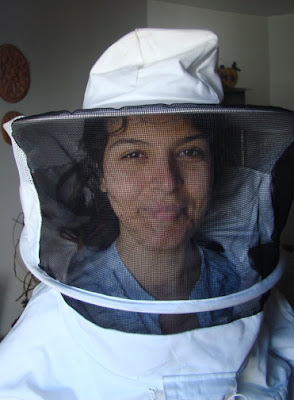 You may know I am a beekeeper---as was my mother, and grandfather. In fact, some of this old-time beekeeping mayhem has gotten me to Iowa and Illinois, has fueled part of the mini-Beyond Vagabond journey, led me to new friends, and has become part of my life. The truth is a bit more complicated. The bees which I had worked with, which had made my name and purpose, were not mine, but my ladlord's and landlady's, owned outright by them but worked by me, as part of an urban revitalization project. After almost five years of work, there were differences in vision, and then, this past weekend, I would bid farewell to those animals, as I was suddenly no longer part of the project. Whether this is temporary, I do not know. To be fair, there are many things afoot, and on shaky ground right now, but I will say, it's rather like getting part of one's personality chewed off. There is part of me that knows that I will regroup. It is easy enough, with so much Lifeblood full of beekeeping knowledge, to continue with that journey. There is money enough and time and resources to build. I have met loyal friends and customers, and I would hope they would continue the journey with me. I believe it will happen. But another part of me laments for those creatures I've lost. Sure, you may laugh--shake your head, even, at the small grief over smaller bugs, all of which look alike. Perhaps it is no consequence for you. But each of those bugs--Apis Mellifera--was a teacher. Each showed me the need for calmness, and the way in which to truly think as they did. I have become a master problem solver, and have bridged a gap from old stories of my grandfather, to a living method of teaching. I was led into awe with each new discovery, and developed a profound respect for the powerful might of these small families. And mostly, I have grown closer to my mother, who had shared never-before heard stories, some which she had nearly forgotten, because of this little project. Perhaps, it is time to live as a solitary bee does....gaining wisdom while on his individual journey....until you find a hive family of your own.